Throughout the research for my first book, I kept hitting on a recurring theme. Dietary fiber is essential for good health. 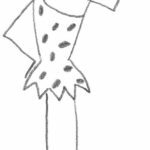 But I also kept hitting on pieces of information that went contrary to conventional wisdom (even contrary to conventional Paleo wisdom). Tidbits like insoluble fiber is even more beneficial than soluble (in spite of the fact that the vast majority of studies only evaluate the benefits of soluble fiber). Even more mind-blowing for me was learning that the whole insoluble fiber being abrasive thing is a myth. In fact, the deeper I delved into this subject, the more information I learned that completely challenged everything I thought I knew about this non-essential nutrient. And, the more everything started to make much more sense too. 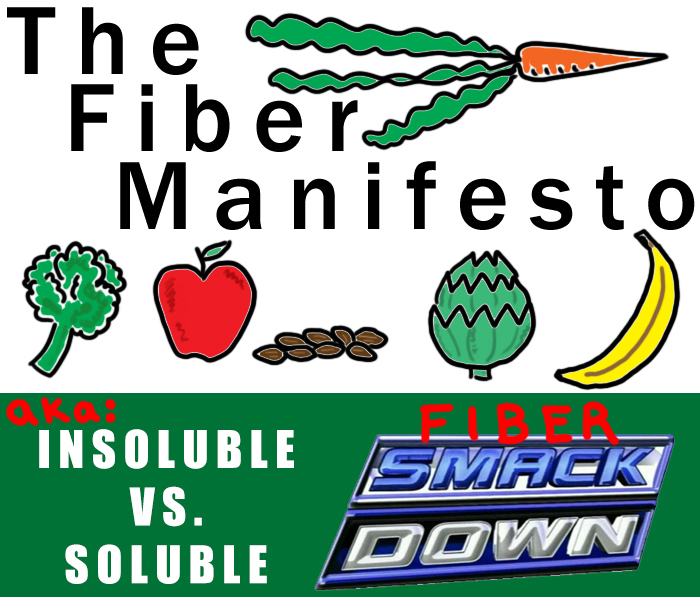 Part 3: Soluble vs. Insoluble Fiber, Let’s Get Ready to RUMBLE! What’s better for you? Soluble or insoluble fiber? Many people will tell you that the answer is soluble. In fact, most of the proposed beneficial effects of fiber consumption are attributed to the viscous and fermentable properties of soluble fiber. In contrast, most studies that evaluate the benefits of soluble versus insoluble fiber show that insoluble is better. To date, the vast majority of studies evaluating the health benefits of fiber are either correlative studies or studies using fiber supplements. Correlative studies look at a particular group of people, get them to fill out surveys about what foods they eat, and then monitor them for health problems. Then, the researchers look to see if there are patterns (like people who ate a particularly high amount of X or Y tended to get Z disease). Fiber supplement studies almost always supplement with soluble, fermentable fibers, most typically inulin or beta-glucans. Most of these studies don’t (or can’t) separate out soluble versus insoluble (and good luck getting more detailed than that! 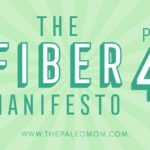 )—so, mostly what they tell us is that your chances of a variety of diseases are lower if you eat a fiber-rich diet (but they can’t tell us why or whether the fiber itself is the part that’s making the difference). The good news is that there are some studies that are starting to tease out the differences between soluble and insoluble fiber when it comes to health and these are proving to be very interesting! Results from prospective cohort studies fairly consistently show that insoluble fiber intake is strongly linked to reduced risk of diabetes. And, while total fiber correlates with decreased risk of cardiovascular disease, this association is much stronger for insoluble fiber compared to soluble. Of course, as is typical in medical research, consensus is hard won and there are certainly studies which show the opposite. For example a study evaluating diet and mortality in type 1 diabetics showed that soluble fiber correlated more strongly than insoluble with reduced risk of complications including death (although both soluble and insoluble fiber reduced risk). Another study in women showed that high soluble fiber intake correlated with reduced risk of developing insulin resistance (but insoluble did not). Nevertheless, there seems to be a stronger case for health benefits for insoluble fiber compared to soluble, although explanations for why are still lacking. One possible explanation are the anti-inflammatory effects of insoluble fiber. One prospective study showed that the higher your dietary fiber, the lower your C-reactive protein (a bloodborne marker of inflammation). The correlation between high fiber and low C-reactive protein levels was even stronger for insoluble fiber than soluble fiber (although both were good). In one of the most fascinating papers I’ve read in a long time, a team of researchers evaluated the long-term effect of two variations of a diet in mice that would normally cause them to become obese. Two groups of mice were fed high-fat diets identical in every respect (and calorie matched) except one diet contained soluble gum type fiber and the other contained insoluble cellulose type fiber. Over the course of the experiment (a year), the mice fed the soluble fiber diet became obese but the mice fed the diet that contained insoluble fiber didn’t (and remember calories were matched and the composition of the two diets were identical other than the type of fiber). The insoluble fiber group had lower blood sugar levels too. The researchers also made some headway in explaining why. The soluble fiber group showed higher markers of happy gut bacteria, like higher breath hydrogen levels and indicators of higher short-chain fatty acid production (which you would expect since gums are highly fermentable but celluloses are only partially fermentable, see Part 2). But, the insoluble fiber group had lower liver triglycerides and had markers of increased fat metabolism. The authors speculate that this is a direct effect on gene expression from the excess short-chain fatty acids produced with the high soluble fiber diet (and show some convincing preliminary evidence to support this explanation). This right here could explain why the rate of obesity increases with lower fiber intake—an beneficial effect on metabolism from insoluble fiber. This also provides a warning against an overdoing soluble fiber (whether through foods sources or supplements). Two groups of mice were fed isocaloric diets that were identical except for fiber type included. Those fed the diet with soluble fiber became obese and those fed the diet with insoluble fiber didn’t. 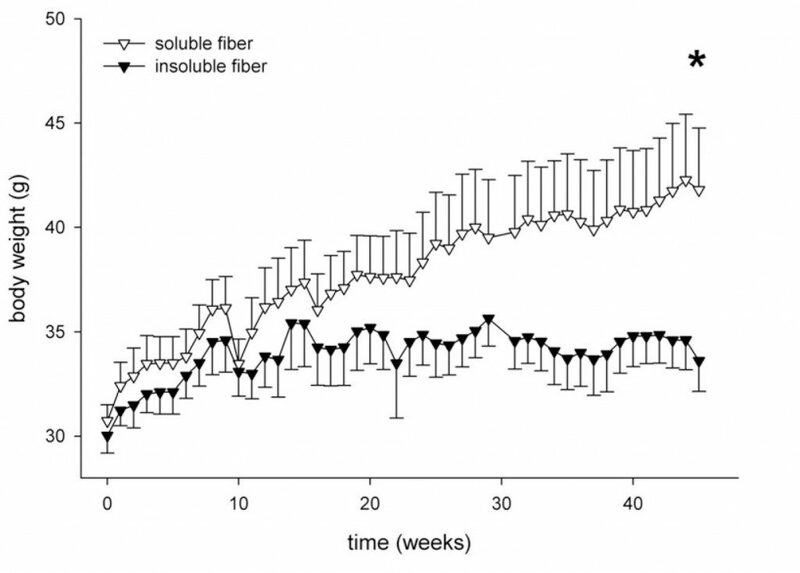 From Isken F, et al, Effects of long-term soluble vs. insoluble dietary fiber intake on high-fat diet-induced obesity in C57BL/6J mice. J Nutr Biochem. 2010 Apr;21(4):278-84. The fact that this study was long term (almost a year long, where the average lifespan of a mouse is about 2 years) was important because an amazing cross-over in the effects was observed after about the ten-week mark. Early on, the benefits of soluble fiber seemed greater or the same as insoluble fiber. At the ten week mark, insoluble fiber started to take over as the clear winner and the effects just kept magnifying over time. This might also explain why some studies show that soluble fiber is better… over the short term, it is (probably due to supporting growth of good bacteria). And it explains why prospective studies that look at long term effects of diet show insoluble fiber to be more beneficial. Soluble fiber is great for feeding our gut bacteria. And soluble fiber is the type that has been shown to have cholesterol-lowering properties (whether or not this is actually a good thing will be discussed in Part 4 of this post series). The short-chain fatty acids that are produced as a result of fiber fermentation are known to be very beneficial (so much so that they are being investigated as a possible supplement, called “postbiotics”)—although too much of a good thing might be a problem (the cause of the changes in fat metabolism in the study I just talked about). What about insoluble fiber? Most types are still fermentable (at least moderately, see part 2 of this series). Insoluble fiber is also one of the most important dietary factors suppressing ghrelin after a meal (ghrelin is the main hormone responsible for the feeling of hunger and it is also an important immune modulator, so having high ghrelin before you eat is very important and then having very low ghrelin after you eat is also very important). Insoluble fiber binds toxins and surplus hormones in the gastrointestinal tract, facilitating their elimination from the body. Furthermore, bile salts are bound by soluble but not insoluble fiber, implying that insoluble fiber supports normal bile salt resorption (recycling) as well as fat digestion, and absorption of essential fatty acids and fat-soluble vitamins (this is also discussed in more detail in the next part of this post series). What about the different subtypes of fiber? 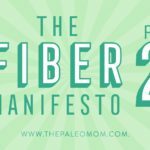 As explained in Part 2 of this post series, there are many types of fiber and the health effects are far more complicated than simply evaluating whether a type of fiber is soluble or insoluble. A recent study evaluated the effects of dietary fiber on pancreatic cancer risk and found that both soluble and insoluble fiber reduced cancer risk but that the associations were strongest for cellulose and lignin. (This study further showed that fruit and vegetable fiber reduced cancer risk but not grain fiber.) This reduced risk might be explained, at least in part, by the phenolic content of lignin fibers. Another study showed that the phenols derived from lignin fibers reduced inflammation, decreased oxidative stress, and protected the kidneys of diabetic rats. Another study evaluating the effects of dietary chitin showed that this fiber is especially good at reducing the proinflammatory oxidized low-density lipoproteins (oxidized LDL) in particular (implicated in atherosclerosis), but didn’t affect the good high density lipoproteins (HDL); and lignin-derived phenols were even more effective than supplementation with olive oil extract. 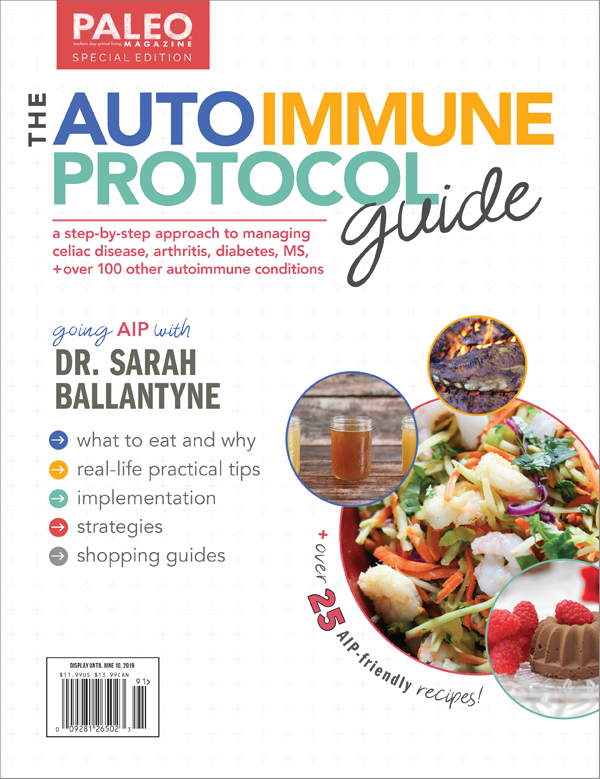 Of course, this is contrasted by a study showing that both chitin and chitosan stimulate a subset of the adaptive immune system (Th1, or type 1 helper T cells which can help some immune and autoimmune diseases but make others worse). Beta-glucans on the other hand also stimulate a different subset of the adaptive immune system (Th2, or type 2 helper T cells this time). Pectins seem to have little to no effect on inflammation. And finally, a pair of studies show that hemicellulose supplementation dramatically reduces inflammation and disease activity in a mouse model of colitis. Yes, the points seem to be adding up for insoluble fiber. But, this isn’t to say that soluble fiber isn’t beneficial. Hundreds of studies have shown otherwise. This is more to say that soluble fiber isn’t the only show in town and that the often overlooked insoluble fiber may actually be the true star. There’s also a strong argument to be made for whole food sources of dietary fiber. Not only are diets rich in vegetables especially linked to reduced inflammation and lower risk of disease, but the complex ways that different fibers interact with the body (including the health of gut bacteria, gut motility, rate of macronutrient absorption, a variety of hormones, and the immune system), the best way to protect against possible negative effects of a specific fiber type is to increase variety (which means avoiding supplements). Take-home message: stop thinking of soluble fiber as “the good fiber”. Both insoluble and soluble fibers are beneficial. And you need them both. Bays HE, et al, Chitin-glucan fiber effects on oxidized low-density lipoprotein: a randomized controlled trial. Eur J Clin Nutr. 2013 Jan;67(1):2-7. Bidoli E, et al Fiber intake and pancreatic cancer risk: a case-control study. Ann Oncol. 2012 Jan;23(1):264-8. Breneman CB and Tucker L. Dietary fibre consumption and insulin resistance – the role of body fat and physical activity. Br J Nutr. 2013 Jul 28;110(2):375-83. Chen Y, et al, 1,3-β-glucan affects the balance of Th1/Th2 cytokines by promoting secretion of anti-inflammatory cytokines in vitro. Mol Med Rep. 2013 Aug;8(2):708-12.
de Munter JS, et al, Whole grain, bran, and germ intake and risk of Type 2 diabetes: a prospective cohort study and systematic review. PLoS Med 2007;4:e261. Isken F, et al, Effects of long-term soluble vs. insoluble dietary fiber intake on high-fat diet-induced obesity in C57BL/6J mice. J Nutr Biochem. 2010 Apr;21(4):278-84. Jenkins DJ, et al, Effect of a very-high-fiber vegetable, fruit, and nut diet on serum lipids and colonic function. Metabolism. 2001 Apr;50(4):494-503. Jenkins DJ, et al, Viscous and nonviscous fibres, nonabsorbable and low glycaemic index carbohydrates, blood lipids and coronary heart disease. Curr Opin Lipidol 2000;11:49–56. Jenkins DJ, et al, Effect of a diet high in vegetables, fruit, and nuts on serum lipids. Metabolism. 1997 May;46(5):530-7. Kanauchi O, et al, Germinated barley foodstuff, a prebiotic product, ameliorates inflammation of colitis through modulation of the enteric environment. J Gastroenterol. 2003;38(2):134-41. Kawashima S, et al, β-glucan curdlan induces IL-10-producing CD4+ T cells and inhibits allergic airway inflammation. J Immunol. 2012 Dec 15;189(12):5713-21. Kokubo Y, et al, Dietary fiber intake and risk of cardiovascular disease in the Japanese population: the Japan Public Health Center-based study cohort. Eur J Clin Nutr. 2011 Nov;65(11):1233-41. Mukai Y, et al, Effect of lignin-derived lignophenols on vascular oxidative stress and inflammation in streptozotocin-induced diabetic rats. Mol Cell Biochem. 2011 Feb;348(1-2):117-24. Sánchez D, et al, Soluble fiber-enriched diets improve inflammation and oxidative stress biomarkers in Zucker fatty rats. Pharmacol Res. 2011 Jul;64(1):31-5. Sato S, et al. Lignin-derived lignophenols attenuate oxidative and inflammatory damage to the kidney in streptozotocin-induced diabetic rats. Free Radic Res. 2009 Dec;43(12):1205-13. Schoenaker DA, et al, Dietary saturated fat and fibre and risk of cardiovascular disease and all-cause mortality among type 1 diabetic patients: the EURODIAB Prospective Complications Study. Diabetologia. 2012 Aug;55(8):2132-41. Schulze MB, et al. Fiber and magnesium intake and incidence of Type 2 diabetes: a prospective study and meta-analysis. Arch Intern Med 2007;167:956–65. Weickert MO and Pfeiffer AF. Metabolic effects of dietary fiber consumption and prevention of diabetes. J Nutr 2008;138:439–42. Yunsheng Ma, et al, Association between dietary fiber and serum C-reactive protein Am J Clin Nutr. 2006 April; 83(4): 760–766. 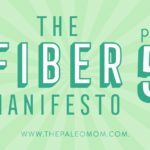 The Fiber Manifesto--Part 1 of 5: What Is Fiber and Why Is it Good? The only insoluble fiber supplements or foods I find are bran/grain in nature. What do you suggest? I really need to find insoluable fiber 🙁 I think it may be the key to constipation and fermenting food in the large intestines. No broom action. And this is coming from a raw food vegan (most days). Do you think when we vitamix our apples, greens, celery etc… It breaks the insoluable fiber down too much? 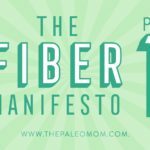 What do you think about fiber and IBD? I have a hard time digesting vegetables during a flare…if I cook them to mush will I still get the fiber I need? Thank you so much for your educated posts! You are my internet hero!!!!!!! 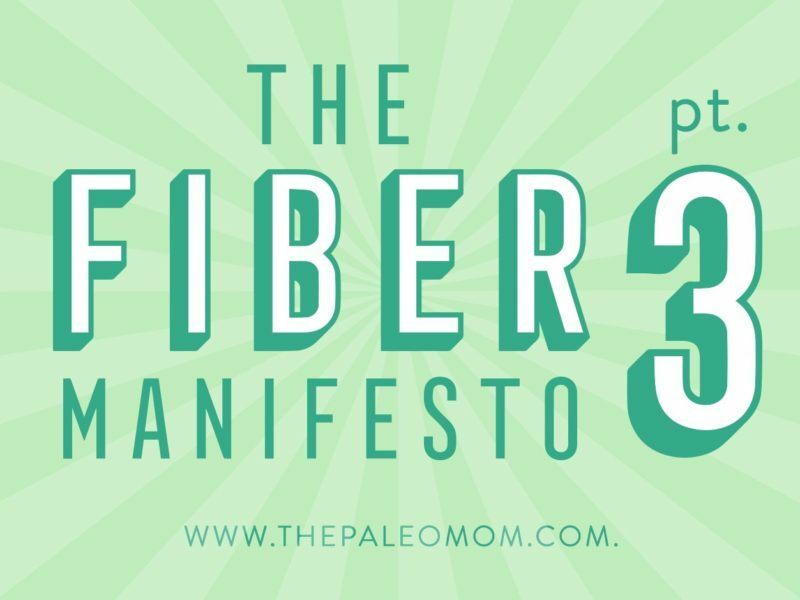 I will be going into this in detail in Part 5 of this series… but the quick answer to your questions, is yes, you still get the fiber if you cook and mush the veggies. I have to share my story of cooked veg. I was vegan from age 15, 37 now, and the bulk of my diet was steamed broccoli, carrots, zucchini and bananas some white rice from time to time but a lot of steamed veg. Daily in large quantities! I did not know what a raw veg was!! I did not go to the bathroom most days. One day we had raw cabbage so I chopped it raw and added to to steamed veg for a raw and steamed mix. After days of doing this bc it tasted so good I started to have BMs. Something about some raw veggies makes a huge dif.for me. But cooked veg to this day 20yrs still does the same thing. It breaks down the fiber and living fiber is magical for moving the waste along. FYI- I do eat meats from time to time but I still feel best mostly raw fruit and veg based, I eat meat when my body says I need some meat. Very intuitive eating has saved me from so much dogma in the food world. Very interesting! I actually prefer raw to cooked most of the time, but I’ve never experimented with all raw or all cooked to see if it impacts me… maybe a fun experiment for when my stress level is lower. I’m sure you’re going there… but I’m eager to see you’re breakdown of which sources of insoluble are better than others. Obviously, kale and its amigos, but I’m curious to see if there are any surprise guests, you know? I’m very curious about your take on whole/pseudo grains, especially rice with its insoluble husks, namely. This makes a lot of sense to me. Gluten-free, sugar-free vegans (even if we fear for their b-vitamins and omega-3’s) appear to pretty well in the waistline department whereas I’ve noticed some Paleo adherents encountering a great deal of trouble when they go the meat-heavy route. While I’m sure there are numerous other variables at work, I think insoluble fiber (like eating a crunchy kale salad every day for lunch) might explain why some people are having more success than others. The bit about ghrelin especially made sense to me. When I have muscle meat and root veg mash–I do not feel as full as I do when I eat my lunchtime salad. Actually, there’s very little information comparing different types of fiber head to head. Pretty much what is known about fiber is in this part and part 1 and 2 in terms of benefits of different sub types. Although, I will be showing more data about subtypes and inflammation in part 5. I’m curious to know what your take is on a book called “The Fiber Menace,” by Konstantin Monastyrsky. He presents some pretty damning evidence on fiber, at least excess fiber, though his focus is more on grains. The book, and some of the supplements he recommends, helped me overcome years of chronic constipation that no doctor had been able to address. I would LOVE to get your take on it. 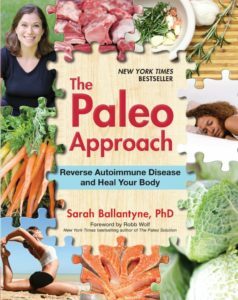 It’s a popular book in the Paleo world but it’s at odds with some of the things you are summing up in your fiber posts, which leaves me feeling very confused. 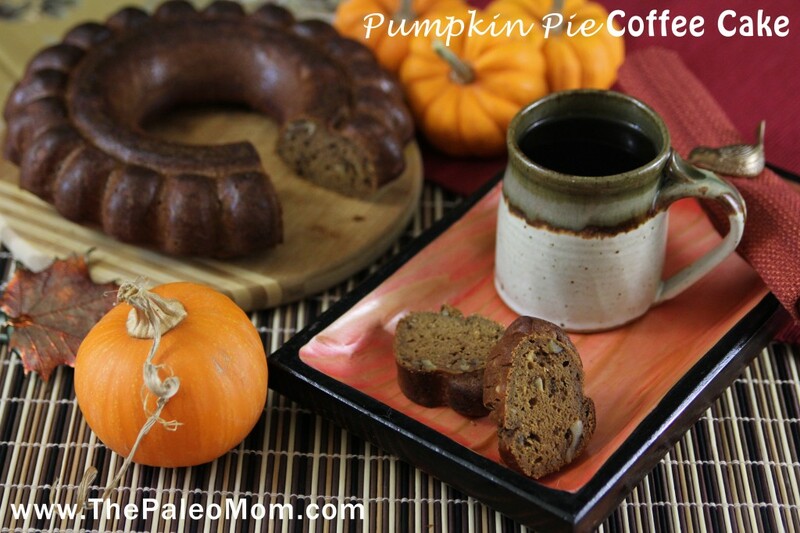 HUGE fan of your recipes and website! I’m caught up on the series! Thank you so much for writing and researching. I noticed in part 2 that you mentioned chicory as having lots of inulin. I’ve done lots of searches on the benefits of chicory, and in these articles where they only talk about tea, they then tell me about inulin. There’s no inulin in my tea, right? how do you promote a healthy gut microbiome? Do you think that cellulose for example in a fiber-rich floor-mix (glutenfree) is acceptable in Autoimmun Protokol and with Leaky Gut syndrome? I used before AIP psyllium husk (1-2 tablespoon/day) and miss it a lot (and my digestion too).